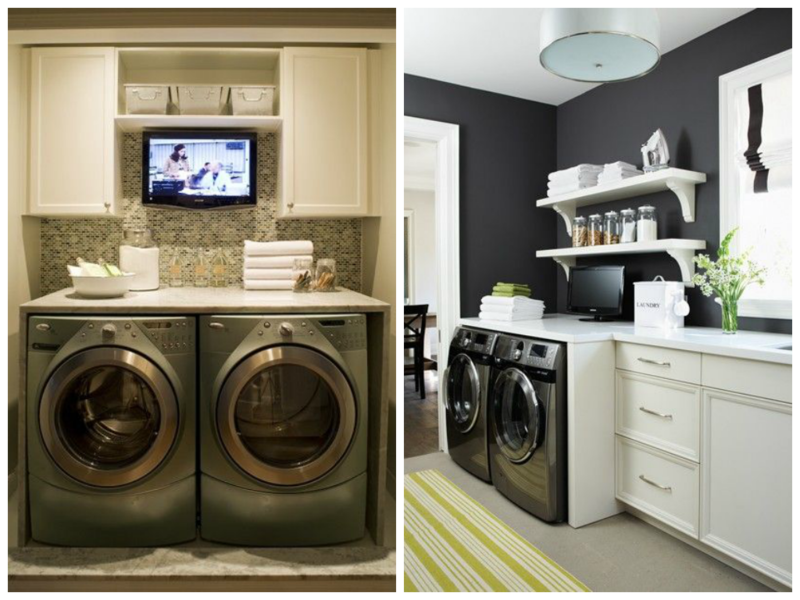 Thinking of making changes to the laundry room? 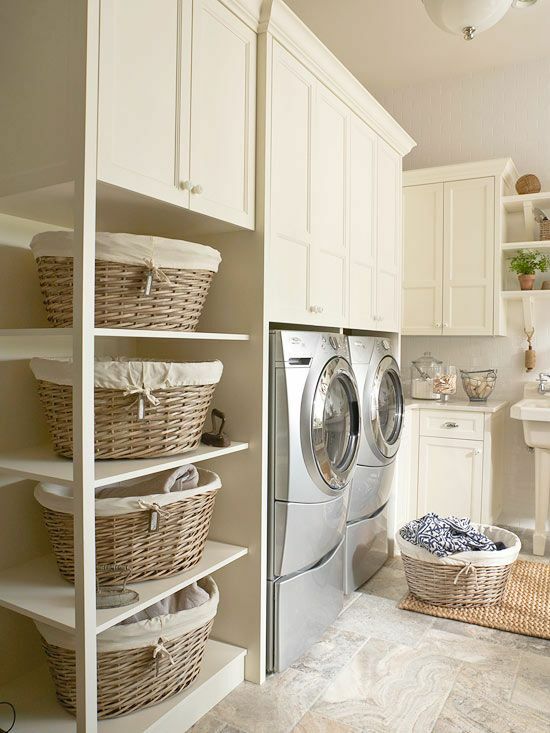 It’s not always easy to find pleasing and practical ideas for the laundry room. In this article you will discover 7 suggestions in 10 pictures that offer solutions which may help inspire you. Whether large of small there are many ways to adapt this space to the needs of your family. 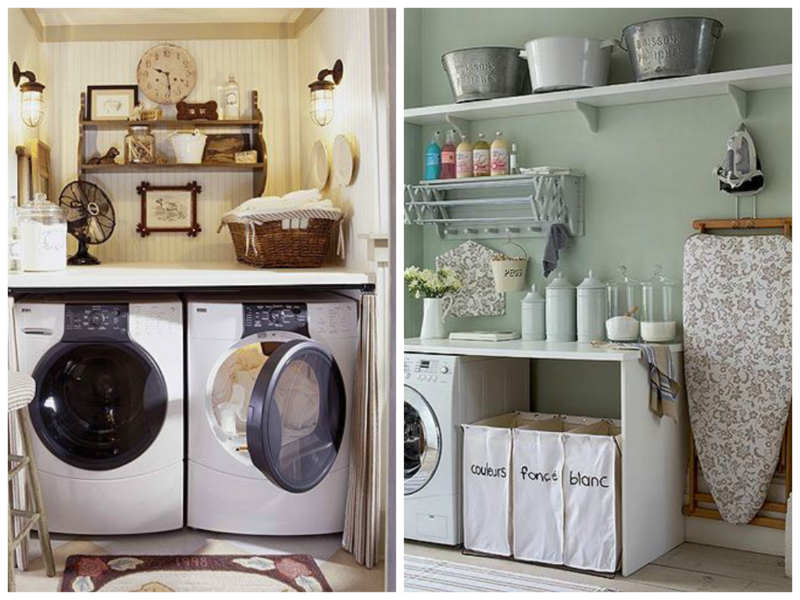 How about a charming little laundry room decorated in a country home style? Notice the decorations made from washing tools and supplies that not only enhance the look but keep everything handy! It’s not always easy to give a finished look to your laundry space when the appliances are out in the open so why not make them part of the cabinetry? First step is to select the appliances wisely and then to build around them. This will not only give the place a more put together look it will also become a more pleasant space in which to accomplish this chore! 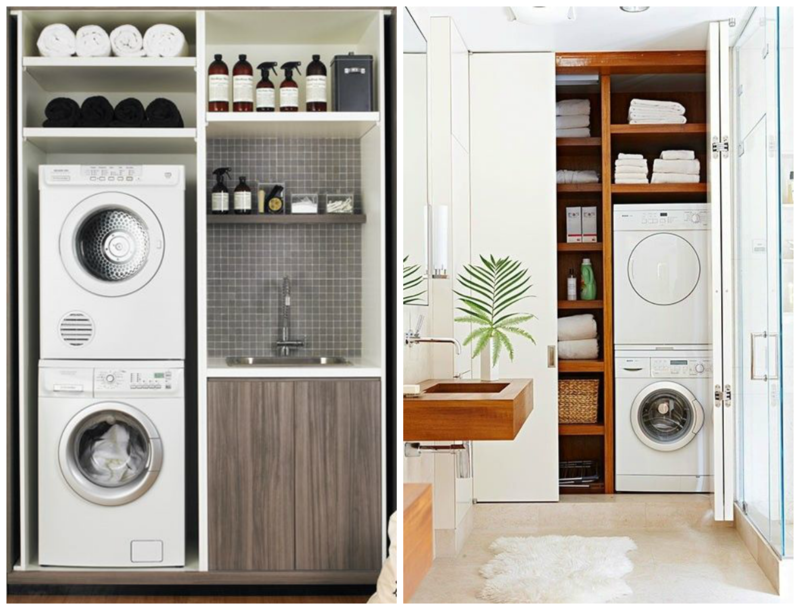 Even if you don’t have the luxury of a separate room, a small space can become a perfect laundry area. 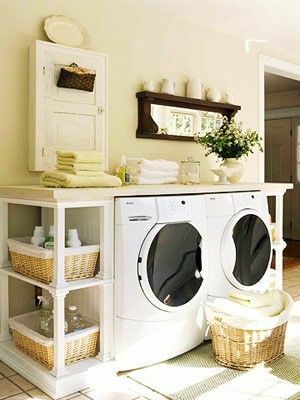 Here are two brilliant ideas for setting up a laundry space where it can be hidden from view behind closed doors when not in use. Front loading, stackable pairs are ideal for a closet and small shelves and baskets are perfect to store soap and other laundry necessities and you can even have a fold away hanger that can be pulled down when it’s time to dry items that are not dryer safe. 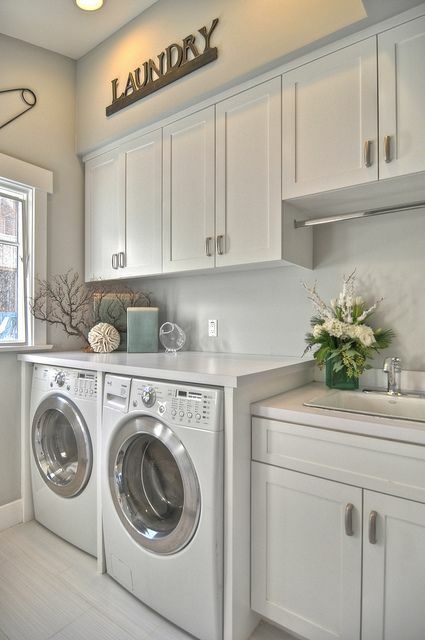 A nicely decorated space in which to do the laundry will make the time spent more pleasant and visually appealing. 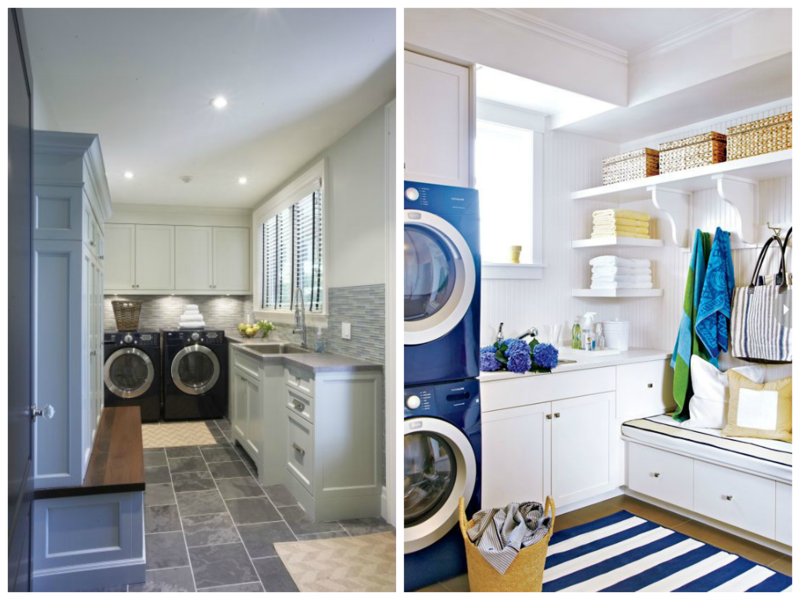 Very practical for a large family, here are two ideas for a combination mud room/laundry room and you can even put the appliances behind closet doors to keep them out of site. You might also want to have a bench as it will be a useful addition to the foyer and it can even be used for storage or for a laundry hamper. Read a house plan : do you know how ? Discover how with these simple tricks.